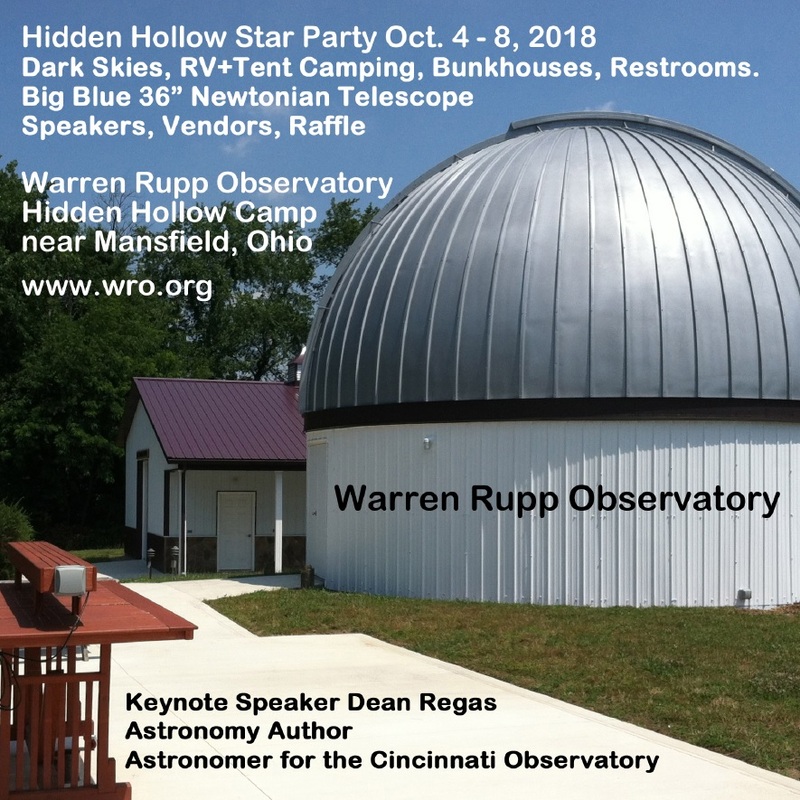 The 2018 Hidden Hollow Star Party was October 4th through 8th! Major Sponsor Explore Scientific. Stay tuned for more. For long time star party fans, you know the legend of Hidden Hollow as one of the friendliest and most comfortable star parties around. 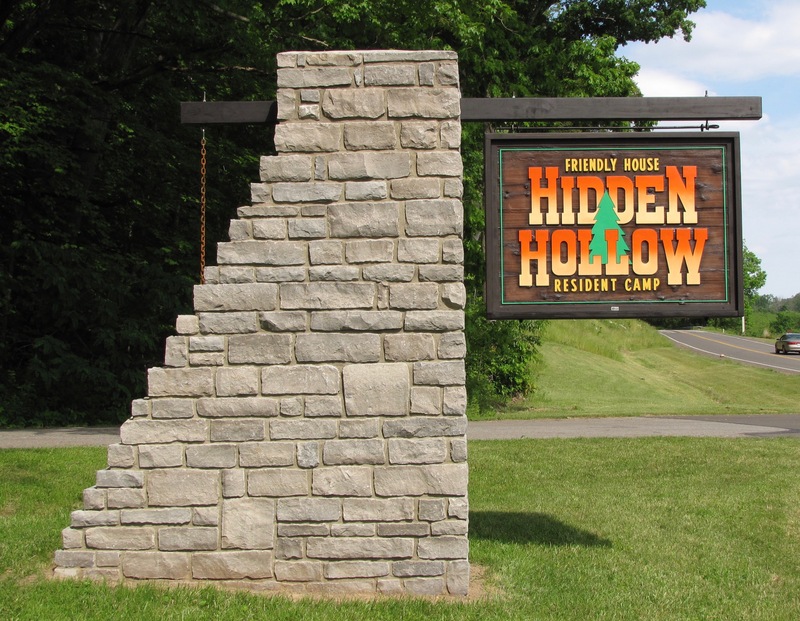 We’re nestled deep in the woods of Hidden Hollow resident camp in northeast Ohio near the town of Mansfield. Each year we provide some of the finest guest speakers available and they join in the fun! Unlike other star parties, we provide cabins and bunkhouses for your comfort, as well as primative camping, hot showers, modern restrooms and a food service vendor. If it rains? It’s no problem. We have indoor facilities and all activities go on. There’s warm areas where you can gather around a fire and converse, places to watch movies, play cards or just hang out. The observing field is well-drained and groomed with plenty of “space” to go around and, of course, you won’t want to miss the views through the Obsevatory’s incredible 36″ Big Blue Beast! One of the most appealing parts about Hidden Hollow is the location itself. Even if you aren’t interested in staying up all night observing, you’ll fully appreciate the fine scenery of the camp itself. During the Fall season, Ohio offers some of the most spectacular foilage in the United States and the pristine, quiet and peaceful surroundings of Hidden Hollow are an ideal place to relax and have an enjoyable weekend. There’s plenty of trails to walk in the woods and nearby attractions, restaurants and shopping. Children and families are always welcome here! Thanks to wide open spaces and peaceful seclusion you’ll have a wonderful time at the Hidden Hollow Star Party. Our guests have voted us #1 as one of the most beautiful astronomical retreats in the country. During your weekend stay you’ll be treated like family as you enjoy our many workshops, contests, vendors, programs, fantastic prizes and observing. We welcome visitors of all ages and you’ll find that no matter where you roam… There’s no place like our home! Come on in. Explore our guest speakers, our activities and the things you’ll have to do and see while you’re here by visiting the link system on the left and enjoy yourself. For directions and nearby restaurants and hotels, click on the map to the right!